Who said he could destroy the temple and in three days build it up? Incomprehensibly powerful weapons are poised to erase human life - your life, that of your loved ones - from off this planet. Many now believe humankind is doomed. They predict that in the not-too-distant future earth will be rendered desolate and uninhabitable. But they will be proved wrong by a startling turn of events! There is good news! A wonderful world tomorrow is coming - despite the threat of nuclear war today. 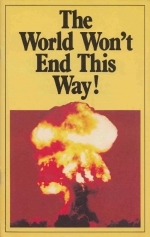 How REAL, many ask, is the threat of human annihilation by nuclear devastation? "We build all these cities, people have all these children - and they're going to get killed. There's no stopping nuclear war now. I mean, they've made the bombs - they're going to use them." Who would have expected these perceptive words, expressing feelings shared by many, were voiced by a 14-year-old?